12/29/2012 12/29/2012 by tom moody Comments Off on "Knife Missile's Return"
An earlier-recorded beat (from a Richard Devine preset) loops in the ADDAC wav player module. The ADDAC's envelope follower uses the loop's rising and falling gain to trigger a filter-and-volume contour for another oscillator (to make the droning sound in the first half). I had to manually set a Cubase tempo to match the ADDAC loop (93.5 bpm). Then I could add the melody parts (also modular-made, with some reverb and delay) and some additional percussion. View of dump.fm main room with Ghostery plugin installed and Facebook cookies and plugins blocked. You can choose what ad sites' and other parasites' code to block; the purple box listing blocked and unblocked plugins is optional. Am going to keep mine on for a week or two as I surf around. It's interesting to see which sites are promiscuous trackers. Salon has 23 plugins; Eschaton has 32; Bloglines has 2. 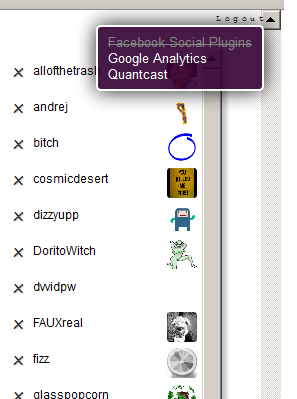 My site has Google Analytics. Have never been that concerned or paranoid about being tracked around the web as a potential customer but lately it's getting annoying to view a consumer product on, say, Amazon, and then start seeing ads for the same product showing up on sidebars of other websites. How stupid do these people thing we are? Don't answer that question.